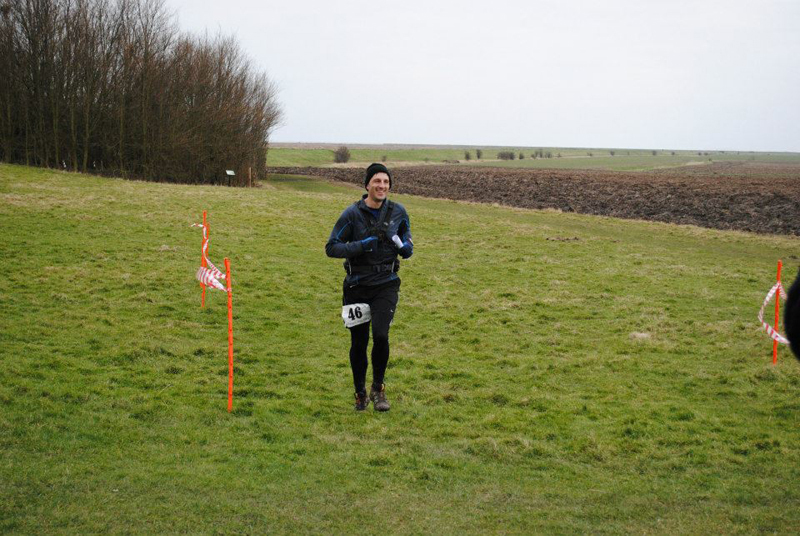 A bit of New Years training blues led to a late entry into the inaugural St Peters Way Ultra organised by Challenge Running. This was primarily a long training run designed to bank a few more miles after a bit of an effort at the Thames Trot a few weeks earlier. Therefore, a nice long slow run was the plan for the day. The fact that I had an up and down week immediately after entering the race with a slight groin injury, a bit of a cold and a lack of sleep having supported Stouty (in part) at his all night charity run definitely helped confirm my less than ambitious intentions! I was kindly offered a bed the night before by Lindley and Sue and had the luxury of only getting up early (5.30 – 6am) instead of really early (4am) like a few others had done to travel to the event. Lindley has also asked me to point out that I forgot my baselayer and borrowed one off Sue for the event… however, Sue did say she the one I borrowed was a mens one as she preferred the longer arm length so male pride may have just about been saved there. I turned up early on a pretty bleak and cold Sunday morning and was greeted by a few familiar faces as I collected my number and checked in including Jerry and Allan who were on sweeping duties today. Runners gather at the start of the race. About 15 minutes before the start Lindley gave a quick briefing before the 46 runners took off followed a little while later by the 2 sweepers. The St Peters Way route is a 40-odd mile run starting from Chipping Ongar and ending at ancient chapel of St Peter on the Wall at Bradwell on Sea. I had never been to the area and had downloaded the route map from the website on my Garmin as a backup to the route maps we were given at the start of the race. 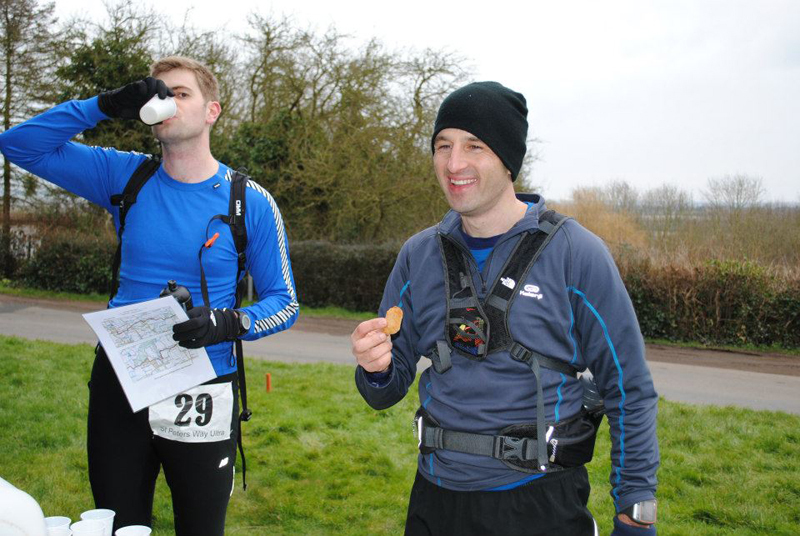 I started out near the back with Keith Godden and we had a brief chat as most of the runners set off ahead of us. We both had an early pitstop as Keith adjusted some of his gear and I stopped for a quick comfort break resulting in us being in last position before the end of the first mile! Keith was quite content with his steady pacing and I pressed on a little as I followed the detailed route directions with the odd glance at the Garmin to check I was on track. Ahead of me I could see a few runners and I continued on towards them. The route itself was waymarked with the St Peters Way marker but it was a course with many twists and turn and required you to pay attention to the directions at all times. It did feel a little stop-start at times as you had to keep referencing in instructions and I did manage to overshoot a couple of turns but nothing too severe as the Garmin let me know when I was heading off course. 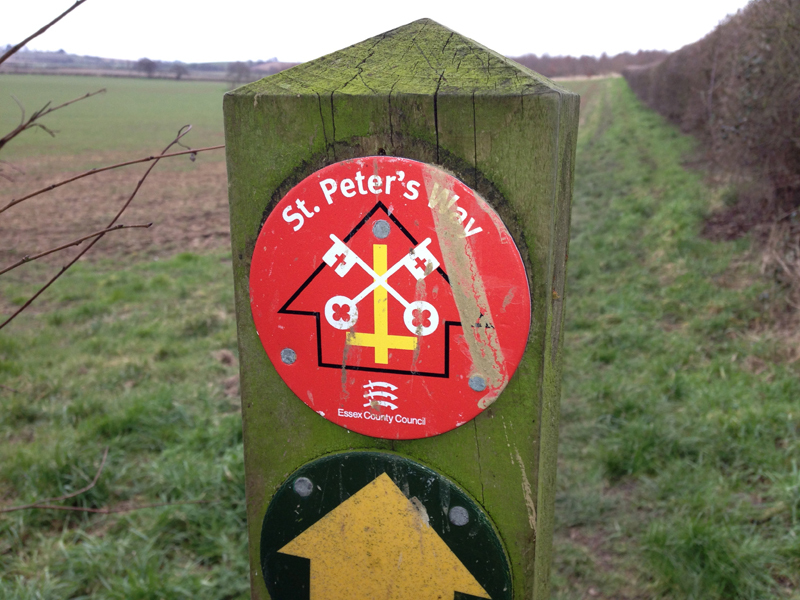 The St Peters Way marker. I arrived at Checkpoint 1 about 8 miles in about 39th place grabbed a few snacks, a drink and was given the next set of directions before plodding on. I caught up with Conrad and Naomi and jogged with them for a bit and had a chat before plodding on ahead and then joined another small group of runners as we arrived at Checkpoint 2 to see Sue manning the checkpoint. I said a quick hello, grabbed some more snacks and followed the group of people ahead. I ran with a couple of people (Tracey & Stuart I think) and for a little while with one navigational slip as we headed into an estate by mistake but soon corrected ourselves when the Garmin decided it was not happy with the route. The route took us through several fields which were difficult to run on and the sheer number of pauses and map references meant this continued to feel like a bit of a stop start effort. 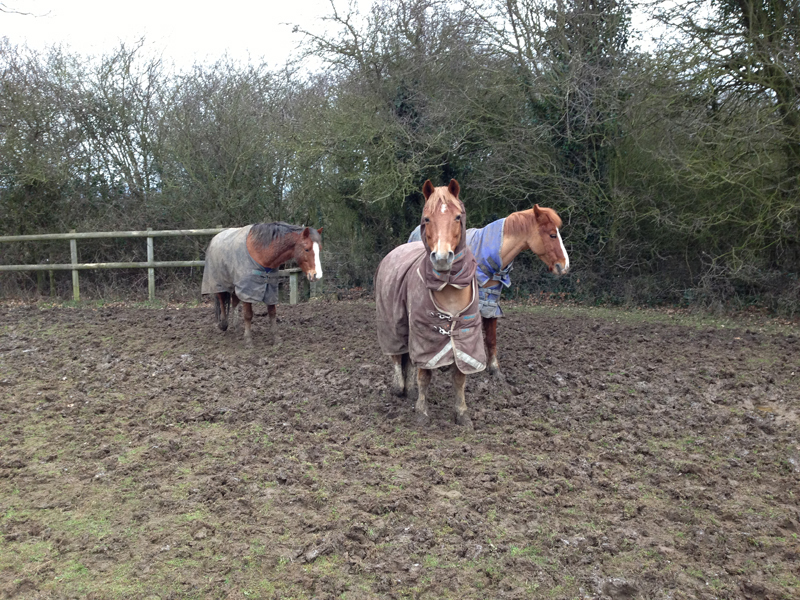 It was also pretty cold and bleak all day and I wore a couple of layers to keep myself warm. The field could have been so much worse. As I had the Garmin set on map mode, I lost track of the time and was quite pleased to avoid having to look at the miles or minutes slowly ticking by as I continued my journey. I moved on ahead of the people I was with and ran solo for a little while before catching up with two guys (Marc and Morgan I believe) who were fairly local and had recce’d the route in advance. I stuck with them for a little while as they easily navigated past the football field and through a few side streets before getting back onto the paths and towards Checkpoint 3 manned by Karen and others which some of Karens delicious brownie cakes in good supply! Unfortunately, one runner had pulled out here with a hamstring injury and had decided to call it a day rather than try and walk out about 20 miles. I carried on by myself now and followed the route instructions with a bit more care as I was going solo. The second half of the route I found a lot more enjoyable than the first half with a few interesting landmarks such as the Church, Marina and the long leg to the Chapel at the end and it felt a lot easier to navigate and less stops and turns. I had a little energy dip prior to the Marina section but grabbed a couple of kit-kat bars and a gel out of my bag and consumed these as I carried on. I bumped into an older lady who was out walking who asked me where I was going and it turned out after a brief chat she organises a long distance walking event on the same route which was a nice little coincidence. I ran the rest of the race by myself and didn’t see too many people ahead or behind. After a stretch on the road at the Village of Steeple, I arrived at Checkpoint 4 to see the same volunteers (Mark, Fiona etc) who had manned Checkpoint 1. As I arrived at the Checkpoint another runner had just set out and I grabbed a few drinks and some snacks and then headed on towards the finish. The last leg actually went by quite quickly. I caught up and overtook a couple of people as we ran on some paths and through some fields until we could see the Chapel at the finish about 2 miles away. The path led you away from the finish a first before taking a 90 degree left hand turn and a long path along a bank towards the finish with the wind in your face. I felt pretty good at this point and put in my quickest mile at this point as I made a determined effort for the finish. I caught up and passed one more runner before trotting in towards the end to see Lindley, Sue and Karen at the finish. Arriving at the finish. Photo by Karen Webber. My Garmin had recorded a distance of 42 miles in 7hrs 55mins and I think I was 16th out of the 46 runners which wasn’t bad after being at the back near the start. However, I don’t recall overtaking that many people so a few may have taken a detour on the way which would have been quite easy to do at times despite the detailed instructions. It wasn’t one of my quickest effort by any means but I was pretty pleased with getting some decent miles in the legs and the comfortable pacing meant I felt pretty good at the end. There’s probably a lesson in pacing a longer distance race there but something I probably won’t quite grasp or put into practice! After the finish, I was given my goody bag containing a T-Shirt and medal and had a hot drink before catching a lift back to the start to collect my car (many thanks to Dave? & partner for the lift) and then a long drive home. 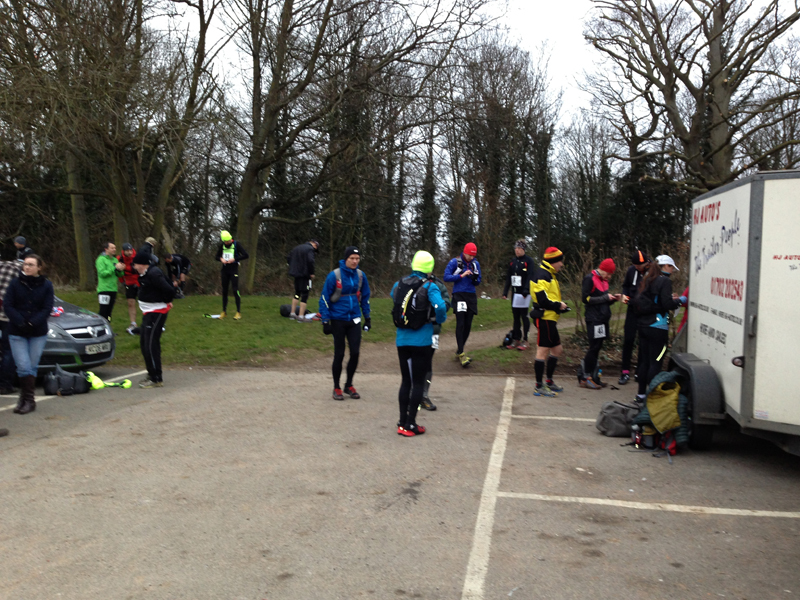 A coach is also provided by the organisors at different times to transport runners to the start if required as the finish location is a little remote. Overall, I quite enjoyed the event. It’s a nice, small friendly race with an enthusiastic team of organisors and volunteers. I also really liked the medal which adopted the St Peters Way sign which makes it stand out from others in the collection and is a nice touch to link the event to the route. 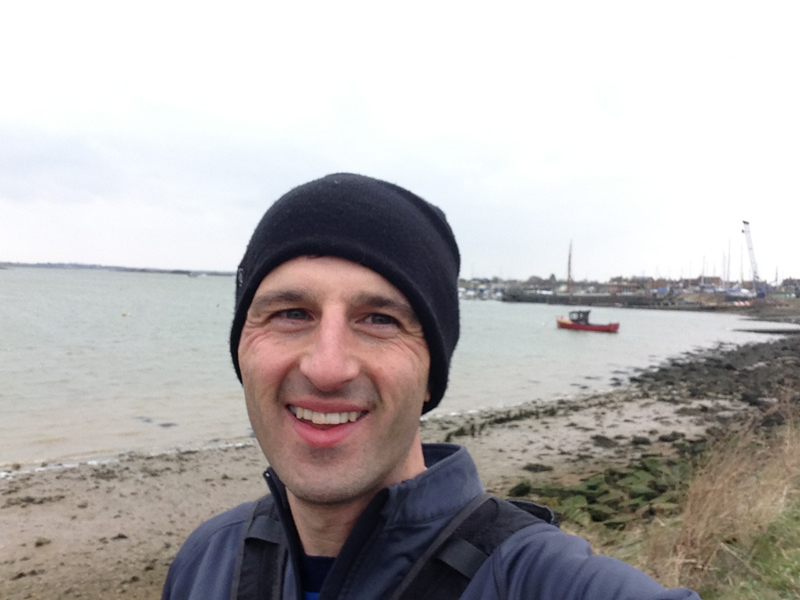 With regard to the route itself, the first half is a little bleak with care needed to follow the right instructions but I enjoyed the second half more partly due to the easier navigation and partly due to the more interesting landmarks. 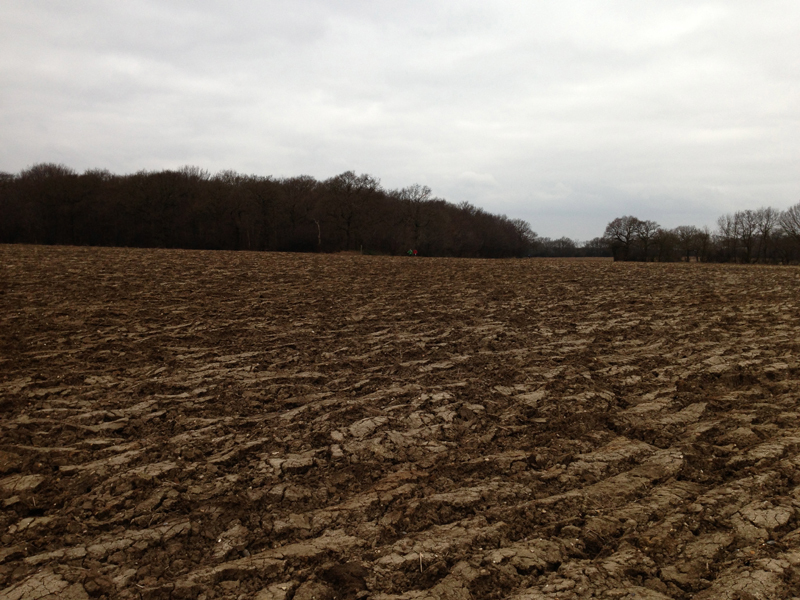 The ground conditions were a little tough at times making running every section a bit more difficult especially when travelling through ploughed fields but it could have been much worse had we had heavier rain. Thanks to Lindley, Sue and team for an enjoyable day.